Little Faces offers a unique learning environment within it’s spacious rooms caring for children aged 3 months to 5 years and offer flexible booking pattens to help those parents that work shifts. Little Faces offer free funding sessions for early learning for 2,3 and 4 year olds. 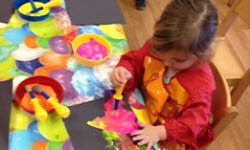 At Little Faces Nursery play is the most important part of our day and through careful observation, every day is based on what the children enjoy best. Whilst also ensuring that they are given opportunities to explore, experiment and investigate. The Little Faces team are all committed to provide high quality child care by ensuring positive relationships are formed with children, parents, carers and the wider community and meeting the needs of all children. Our nursery is divided into 4 age groups babies, under 2’s, 2-3, and 3-5 years. 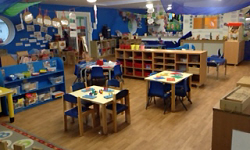 Each spacious room creates an environment that has been especially designed in line with the Early years Foundation stage to focus on the unique needs of all children. 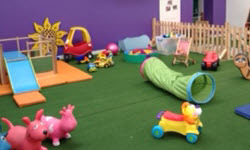 The nursery also has its very own unique indoor activity area designed for all children to enjoy and achieve. Our aim is to work with parents to provide a quality and flexible childcare provision by providing term time only for school teachers, flexible booking days for shift workers and NHS staff and local businesses. For information on places please contact Michelle on 0161 637 2281 or email info@littlefacesnursery.co.uk . "We would just like to say a very big THANK YOU for helping my child settle so well. 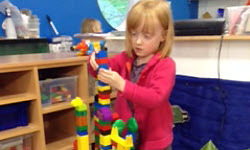 She seems to love it at Little Faces and comes home so happy and can't wait to go back again in the morning." Rooms which extend opportunities for young children and baby's to explore new experiences in secure, safe yet challenging spaces. Including large indoor and outdoor play areas for all children.